The famous Old Testament man, Job, had a pretty rough time (see Job 2). Unbeknown to Job, God was allowing Satan to test him (see Job 2). Needless to say Job was distressed and had some questions. 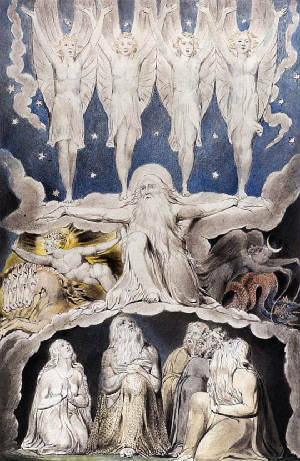 God arrives in a whirlwind in chapter 38 and gives Job a 4 chapter lecture about the wonders of nature. So, why would this be an answer to Job? God is effectively saying, Job, I know all there is to know, and I control all things -- so, Job, in the hard times you are going through, you should have this assurance. Notice that everyone is "without excuse" because God's reality is plainly evidenced in all he has made. This goes along with God's approach to Job, that much is to be known about God from his created works. In sporting contests, beating a really good opponent is a happy, worthy test of one's abilities. God allows himself to have an immensely powerful, shrewd, capable, opponent in the Devil, Satan, . The Devil's defense and counterattack to God's special creation, is known as evolution, or Darwinism, also as naturalism or materialism. This is the idea that everything originated by cosmic accident and thus, is no evidence for God or his existence. Nor, for any duty on our part toward him. Obviously, the Job and Romans, and numerous other passages match, just what we see in nature, the immense power, wisdom, grandeur, and goodness of the Creator God. The Devil's attacks are often subliminal -- that is -- he sneaks them in below our radar screen, below our level of awareness -- we don't even realize we are being attacked. They are insidious -- when we realize it -- it is too late to prevent damage. Often times the enemy tries to slip us evil thoughts, ideas, practices or doctrines under the guise of doing some good thing. Jesus said in Matthew 26:41, Watch and pray, that ye enter not into temptation: the spirit indeed is willing, but the flesh is weak. We must be wary and on guard. We are not use to this. Be not deceived: evil communications corrupt good manners. -- . The King James Bible uses, and, the passage does mean, all forms of "communing," be it TV, reading, or time spent with friends. Any and all can be instruments to lead us astray from God. People's hearts tend to get "knit together," in spending time together, and this can cause us to put God in second place. Jury members are strictly instructed not to talk to anyone, or watch any media broadcasts covering the area of the trial. Even though one thinks he or she is not affected, there is the inevitable subliminal influence down deep inside. The Bible and Nature actually do go together. But, we are continually immersed in public situations and in media presentations where evolution is simply ASSUMED. It is PRESUPPOSED, or ASSUMED to be true, to begin with. Most of modern science is founded upon a evolution, assumed as being true, regardless of evidence. This subtle practice of automatically, stealthily, basing all science on the evolutionary presumption, without so much as mentioning it – produces an immensely powerful subliminal, persuasive effect on an individual, that is below the level of one's consciousness to detect. It is thus, critical that true science, that is, nature, and Scripture be teamed up together. It is true – God is revealed in BOTH Nature and Scripture. These MUST go together as a key and lock. but then I said to myself, "Why doesn’t he just tell them the truth"? Yes, but there is believing, then there is believing. Many of us are like that, we say we are believers, but we are really reluctant to put our full weight and confidence on Christianity. So-called Bible experts, often refer to creation science, as "apologetics" -- like it is some optional extra, or even a "side-track" thing. This is flat wrong, as the very existence of Job chapters 38-41, Romans 1, and other passages make plain. Just like on jury duty, it is critical to match up testimony and physical evidences to reach a right verdict. See my other pages, Creation and Scripture, and The Creation Outreach Approach. We have been compromised by the subliminal message of evolution. Job is helpful, here. The Old Testament book of Job is amazing – Yes, chapters 4-37 are somewhat tedious – but things get real interesting when God shows up in a whirlwind in chapter 38. Job has suffered for 35 chapters or so, and what does God have to say? God lectures Job for four chapters on creation science or you might say the wonders of nature. Why didn’t God give a theological lecture? What is God’s main point? Are not two sparrows sold for a farthing? and one of them shall not fall on the ground without your Father? A four-chapter creation science lecture to Job – WOW -- this is instructive in many ways. God is clearly the utterly complete master of all creation – nothing really happens by accident. and the inevitable result is that nature is found to be much, much, much, more intricate, elegant, and high tech than anything we ever imagined. Nature is NEVER simpler than we thought, It’s ALWAYS more complex, more complicated than we thought. Having earned my living as a pilot for 25 years, I can say that my confidence increased with the number of flying hours, to the point, that climbing into an airplane was no different than climbing into the family car. As we study and meditate on the immense range, depth, and magnitude of God’s immense power, intellect, wisdom, love, and beauty, etc., etc., clearly seen in his creative act, our confidence, awe, and love will also increase so that he becomes the “Almighty” and total reality to us. Not sure you are a Christian? Check out my page, They Came to Jesus!